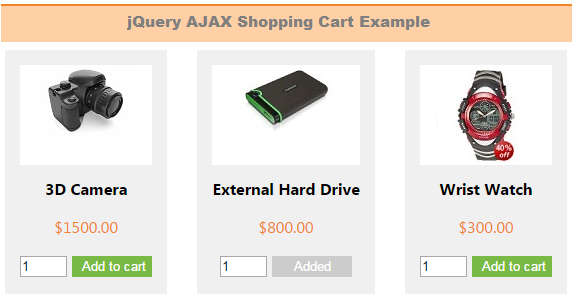 In this tutorial, we are going to create a shopping cart using jQuery AJAX. In a previous tutorial, we have seen simple shopping cart code using PHP without jQuery or AJAX. In this shopping cart example, we can add products to the cart to checkout. Using jQuery we are updating product status in UI whether it is added to the cart or not. This code is used to list products from the database. This script is used to send AJAX call to the PHP based on the cart action. After AJAX action, it will update UI with the cart items in the session. This PHP code will be executed on the AJAX call send via jQuery function.